Two fierce NFC East rivals, the Washington Redskins and Dallas Cowboys, met for the conference championship on January 22, 1983. With divisions set aside due to a 57-day strike by the players that limited the schedule to nine games, Washington topped the NFC with an 8-1 record and the Cowboys ranked second at 6-3. The usual playoff format was set aside for a tournament of the top eight teams in each conference. Washington easily defeated Detroit and Minnesota in the first two rounds to advance to the NFC title game, and the Cowboys got past the Buccaneers and Packers. Washington had last been in the postseason in 1976 and was appearing for the first time under second-year Head Coach Joe Gibbs. Little had been expected of the Redskins coming into the ’82 season, but things fell into place on both sides of the ball. On offense, the line, known as “the Hogs”, coalesced into the league’s best unit. QB Joe Theismann had a Pro Bowl year and, while WR Art Monk was missing in the postseason with a broken foot, WR Charlie Brown was coming off of a fine year in which he was also selected to the Pro Bowl. 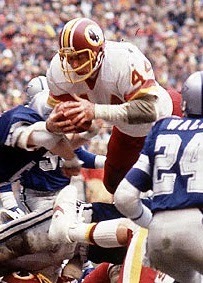 Workhorse 33-year-old RB John Riggins (pictured above) was stepping up in the playoffs with hundred-yard performances in the two wins. The defense had improved dramatically since the preceding year and led the league in fewest points allowed in the short season. Mark Moseley received rare MVP plaudits for a placekicker with his 20 field goals in just 21 attempts. The Cowboys, coached for the 23rd season by Tom Landry, were back in the NFC Championship game for the third consecutive year, and had lost the last two. QB Danny White was capable but had taken criticism for failing to win big games. Still, he was a Pro Bowl performer, as was star RB Tony Dorsett, who led the NFC in the abbreviated season with 745 rushing yards. The receiving corps was a good one that featured WRs Drew Pearson and Tony Hill. The aging defensive line was still formidable, as was the defensive backfield. There were 55,045 enthusiastic fans in attendance for the Saturday game at RFK Stadium. The Cowboys had the first possession and drove 75 yards in 10 plays, with Tony Dorsett running effectively and Danny White completing three passes. But after reaching the Washington 15 yard line, the Redskins stiffened on defense. On third down, CB Jeris White knocked a pass out of Drew Pearson’s hands that would have been a touchdown and Dallas settled for a 27-yard Rafael Septien field goal. The Redskins responded by driving 84 yards, starting off with two carries by John Riggins for 12 yards. Theismann had completions to TE Rick Walker for nine yards, 15 yards to TE Don Warren, and 11 yards to WR Alvin Garrett, and Riggins contributed a 17-yard run. The possession was capped by a pass from Theismann to Charlie Brown for a 19-yard touchdown. Mark Moseley added the extra point and Washington was in front by 7-3. On their next series, the Redskins converted a fourth-and-one play at the Dallas 40 with a carry by Riggins, but they ultimately came up empty when the drive stalled and Moseley’s 27-yard field goal attempt hit the left upright and was unsuccessful. The Cowboys were having difficulty on offense, with three straight possessions in which they were unable to get a first down. As the first half wound down, a punt by the Redskins was muffed by Dallas DB Rod Hill and, while LB Monte Coleman recovered in the end zone for Washington, the ball had to come back to the 11. It was a formality as Riggins carried twice for eight yards and, after RB Joe Washington gave the Redskins a first down at the one, Riggins carried again for a touchdown with 3:41 remaining in the first half. Moseley again added the PAT and Washington took a 14-3 lead into halftime. In the last minute of the half, White was hit hard by DE Dexter Manley and suffered a concussion, knocking him out of the game. He was replaced by third-year backup QB Gary Hogeboom (pictured at left), who had thrown only eight passes all season. A fumble by Washington DB Mike Nelms returning the second half kickoff gave Dallas the first possession in the third quarter, and Hogeboom directed the Cowboys to a score, finishing the series off with a six-yard touchdown pass to Pearson. Septien’s point after narrowed the Washington lead to 14-10, but Nelms returned the ensuing kickoff 76 yards to the Dallas 20. Five plays later, Riggins ran for a four-yard TD, Moseley converted, and the home team was up by eleven points at 21-10. The Cowboys blitzed linebackers and defensive backs on first down in an effort to shut down Riggins and the relentless Washington running attack. Later in the period, Hogeboom threw to WR Butch Johnson for a 23-yard TD and, with Septien adding the extra point, Dallas was behind by only 21-17. The tide turned in the fourth quarter. First, LB Mel Kaufman intercepted a low pass by Hogeboom that was intended for WR Tony Hill. That set up a Moseley field goal from 29 yards to make the score 24-17. Then, on the next play from scrimmage, DT Darryl Grant (pictured at right) grabbed a pass tipped by Manley and ran 10 yards for a touchdown. Moseley converted and, with two scores in a span of 17 seconds, Washington was ahead by two touchdowns with 6:55 remaining in the contest. The Redskins got the ball back with 4:26 to play and Riggins ran nine straight times for 43 yards to finish off the Cowboys by a final score of 31-17. The game had an odd ending when Theismann took a knee on fourth down with 12 seconds left, forgetting that the clock would stop for the change of possession. The Cowboys left the field and had to be called back, returning after five minutes to run the last play with Pearson taking the snap and not attempting to advance. In the meantime, happy Washington fans had already flooded the field and torn down the goal posts. Dallas led in total yards (340 to 260) and first downs (21 to 18). Only 65 of those yards came on the ground, as opposed to 137 for the Redskins, and the Cowboys also turned the ball over three times, to none by Washington. John Riggins set a NFL postseason record with his third straight hundred-yard rushing performance (he made it four straight in the Super Bowl) as he gained 140 yards on 36 carries that included two touchdowns. Joe Theismann completed 12 of 20 passes for 150 yards and a TD with no interceptions. 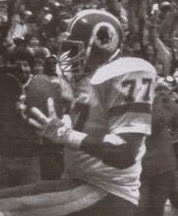 Alvin Garrett, performing well in the playoffs as the replacement for Art Monk, had four catches for 46 yards and Charlie Brown gained 54 yards on his three receptions that included a TD. 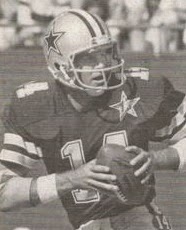 For the Cowboys, Gary Hogeboom was successful on 14 of 29 throws for 162 yards in relief, but after tossing two TDs he gave up the two interceptions. Prior to leaving the contest, Danny White was 9-of-15 for 113 yards and no TDs, although also with none picked off. Tony Dorsett was held to 57 yards on 15 rushing attempts and he gained 29 yards on two catches. Three Dallas receivers caught five passes apiece, with Butch Johnson gaining the most yards with 73 that included a touchdown, Tony Hill contributing 59 yards, and Drew Pearson accounting for 55 yards and a TD. The pleasure continued for the Redskins, who defeated Miami in the Super Bowl. Riggins was again the star as he rushed for 166 yards. They repeated as NFC Champions in 1983. Dallas returned to the playoffs in ‘83, finishing second to Washington in the NFC East, but lost in the Wild Card round. The Cowboys would not appear in another NFC Championship game until the 1992 season. Gary Hogeboom came up short in his relief performance against the Redskins, but it set the stage for a quarterback controversy that culminated with his getting the starting job ahead of Danny White in 1984. His performance was lackluster, White took back the reigns, and Hogeboom was traded to the Colts in ‘86.